Nabadwip is a holy town situated at the picturesque confluence of the Bhagirathi and Jalangi Rivers in the Nadia district of West Bengal. The ancient temple town is spread across an area of 11.66 Sq. Km. Nabadwip was historically the erstwhile capital of Bengal during 12th century B.C., which was under the sovereign-ship of Lakshman Sen, the last Hindu Sovereign of Bengal. Nabadwip is basically an archipelago of 9 islands that constitutes together under the name of “Nabadwip” which literally means ‘nine islands’ in Bengali language. The islands are named Antardwip, Simantadwip, Rudradwip, Madhyadwip, Godrumdwip, Ritudwip, Jahnudwip, Modadrumdwip, and Koladwip. The names of the nine islands uniquely describe the nine forms of devotional services to the Lord which are complete surrender, patient hearing, chanting the holy name, perfect remembering, service at the lotus feet of the Lord, ideal worshiping, unconditional praying, serving and eternal friendship with the Lord. The Chaitanya era is considered to be the most luminous epoch of Nabadwip’s history. It was during this time that the ‘Bhakti Movement” originated here and spread far and wide marking a transitional phase of Hinduism in history. As Brindaban Das, the celebrated biographer of Sri Chaitanya has rightly stated, “No place is equal to Nabadwip on earth because Chaitanya was there incarnated.” Sri Chaitanya was not only a divine incarnation but he was also a social reformer and a great philanthropist of his time. Nabadwip has always been renowned for its rich cultural and educational past. It was and still is a very sacrosanct and reputed seat of learning, which has produced many notable scholars and pundits since time immemorial in the fields of law, literature, astronomy, poetry, grammar and theology respectively. 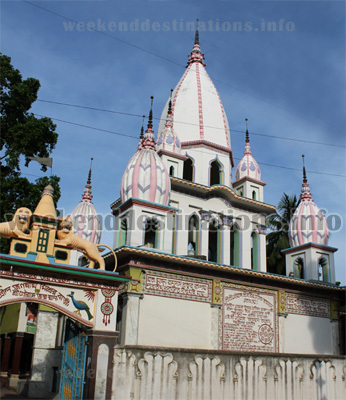 Shonar Gauranga Temple – This temple is the star attraction of Nabadwip that has enshrined in it the golden statue of Lord Sri Chaitanya Mahaprabhu. The temple is centrally located at Yogapitha, which was the holy birthplace of Sri Chaitanya Lord. It was here that Sri Chaitanya Mahaprabhu spent most of his transcendental past-times on Earth. 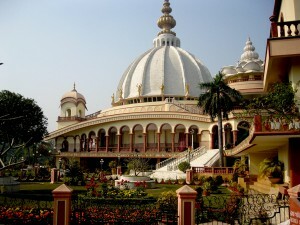 Radharani Temple – The temple is dedicated to the divine consort of Lord Krishna – “Radharani”. The idol of Radharani here is beautifully divine with many embellishments of jewels and flowers. The temple surrounding reverberates all through year with holy chants of Lord Krishna along with beautiful devotional songs in praise of the Lord. 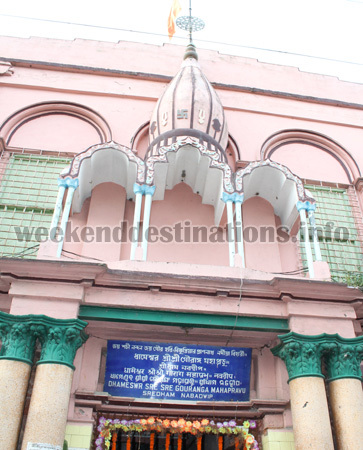 Sri Chaitanya Saraswat Math – This holy monastery was established in 1941 in honor of Lord Chaitanya Mahaprabhu by Srila Sridhar Maharaja also known as Om Vishnupad Sri Srila Bhakti Rakshak Sridhar Maharaj. He was the direct disciple of Sri Chitanya Mahaprabhu. The math works towards the implementation of spiritual, devotional and social services towards the Supreme Lord and all his devotees. Sri Devananda Gaudiya Math – This sacred monastery is situated at Koladwip which is one of the isles of Nabadwip. The math was established by Srila Bhaktisiddhanta Maharaja many centuries back. The temple shrine of the math is dedicated to Lord Gaura and Gadadhara. It is swarmed by thousands devotees every year. The monastery also conducts many devotional and social services which are very noteworthy contributions towards the benefit of the society. 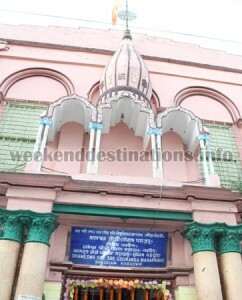 Sri Mahaprabhu Temple – This temple is most prominent for its three shrines. The first shrine is dedicated to Lord Krishna & Radha along with Sri Chaitanya Mahaprabhu, the second shrine is devoted to only Sri Chaitanya Mahaprabhu (depicting his maha-praksa-lila), the third shrine is dedicated to Sri Gaura Nitai. The temple is located at Srivasa Angan. Things to do at Nabadwip: The city of Nabadwip is the liveliest during the holy festivals of Krishna Janmashtami, Navaratri, Holi, Ras Purnima, Jhulan Purnima, Ras Festival and the Birth festival celebration of renowned Saint of Bengal Sri Chaitanya Mahaprabhu. During these festive months you can enjoy the religiosity and traditionalism of the place with a variety of fun-fair and attractive events. Mayapur Dham – The headquarters of ISKCON where the legendary ‘Hare Krishna” movement began under the benign auspices of Swami Bhaktivedanta Prabhupada Maharaj. 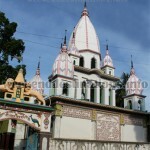 It is one of the most popular pilgrimage spots of Bengal. The Mayapurdham houses the temples of Lord Krishna and his divine consort Radharani. The temple complex also houses the Samadhi shrine of Swami Prabhupada. Krishnanagar – It is most noted for its artistry of clay pottery in West Bengal. It is also known historically for its rich cultural heritage. The town is also the birth place of illustrious Bengali playwright, poet and composer Sri Dwijendra Lal Roy. The famous palace of Raja Krishna Chandra is also located here. It was also a major axis point of Christian missionary activity during the colonial era. Bethuadahari – The Bethuadahari Wildlife Sanctuary is another prominent place located near Nabadwip. The sanctuary wildlife consists of a large variety of assorted animal species like the spotted deer, porcupine, common langur, Bengal fox, pythons and many other varieties of snakes. There is also a wide range of bird species that includes the Indian cuckoo, barbets, parakeets, parrots and other varieties of small birds. Shantipur – Most noted place for the birth of Sri Bijoy Krishna Goswami Prabhu, an eminent saint of Bengal and an ardent Brahmo social reformer. The town of Shantipur is also most noted for its rich cultural and educational importance of being an important center for Sanskrit learning and literature. Some important structures in this town include the Shayam Chand Temple, Jaleshwar Temple, the Adwaita Prabhu Temple and the Topkhana Mosque (built during the Mughal period). How to reach Nabadwip: Nabadwip is well connected by road and railway. Nearest airport is the Kolkata International Airport which is 130 kilometers from Nabadwip. By rail Nabadwip is well connected with neighboring states of Assam, Orissa and Bihar. Special railway expresses have direct stoppage at the Nabadwip Dham. Nabadwip is 112 kilometers from Sealdah, 105 kilometers from Howrah and 65 kilometers from Bandel on the Eastern Railway lines section. Nabadwip can also be reached from nearby Krishanagar by bus. For moving around the town, you can either walk by foot or take the spacious three-wheeled rickshaws to visit the sightseeing spots. Best time to visit Nabadwip: Nabadwip has a hot and humid weather. Winters are very pleasant. The best months to visit are from October to March. These months are also ideally the festive months of the year, hence the best time for pilgrimages and holidays as well. Lodging and Dining facilities at Nabadwip: If you are visiting Nabadwip during the festive seasons then make sure to book your stay in advance to avoid the rush. 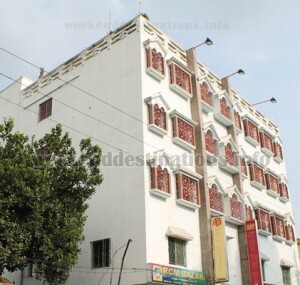 Our hotel at Nabadwip has good AC and non AC rooms with attached bathrooms. Different types of rooms are available – Deluxe and Standard. Family 4-Bed rooms are also available at our Nabadwip luxury hotel. There is also a multi-cuisine restaurant where veg and non-veg food is available. Bengali cuisine that is extremely palatable and popular is available throughout Nabadwip. The hotel reception can also arrange for local trips of Nabadwip sightseeing and also help pilgrims to offer pujas and have prasad and bhog.